Successfully Added Deluxe Solar Charger - Green Power for Portable Electronics to your Shopping Cart. 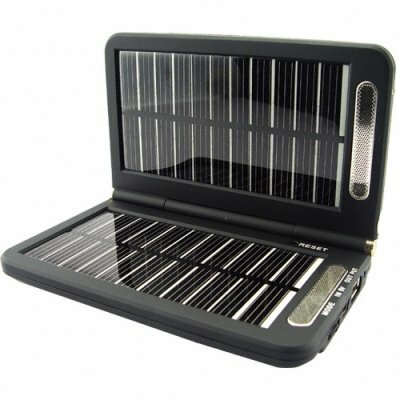 Solar charger with built-in high capacity battery pack for providing power for all popular portable electronic devices. This well designed dual-panel charger is ideal for the person on the go or anyone planning an extended trip. The deluxe edition solar charger can power cellphones, iPods, MP3/MP4 players, digital cameras, and similar portable electronics. What makes this model of solar energy battery charger better than other models you may have considered? This deluxe model has control for the output voltage/current, power level indication, connection adapters for most popular electronics, and its working temperature range can withstand almost any extreme. If all that wasn't enough, this can also be used as just a regular backup power source. Once the internal battery is fully charged you can keep this in your car or backpack and use it whenever you want, day or night. While providing clean, cheap green power is its main strength, you will find that it can also easily be used as a backup battery for your DV camera or ILife product. Solar Energy Battery Charger for Portable Electronics. Deluxe model having variable voltage/current output and power level indication. Includes connectors for most popular brand cell phones and portable electronics. What is the output in amperes for this solar charger? I use it to increase the autonomy of my Archos 605 wifi, and it is tremendously useful. It charges very well on AC, but not so completely on solar, which does not make it totally autonomous, except for small requirements like small mp3 player or cellphone. For stronger requirements, AC charging is necessary. It is unique in its capacity to deliver higher voltages with very decent amperage. It can even recharge my video camera at 12V. Cool. on 2009-03-28 08:14:36 i like it! So great! i like it! !